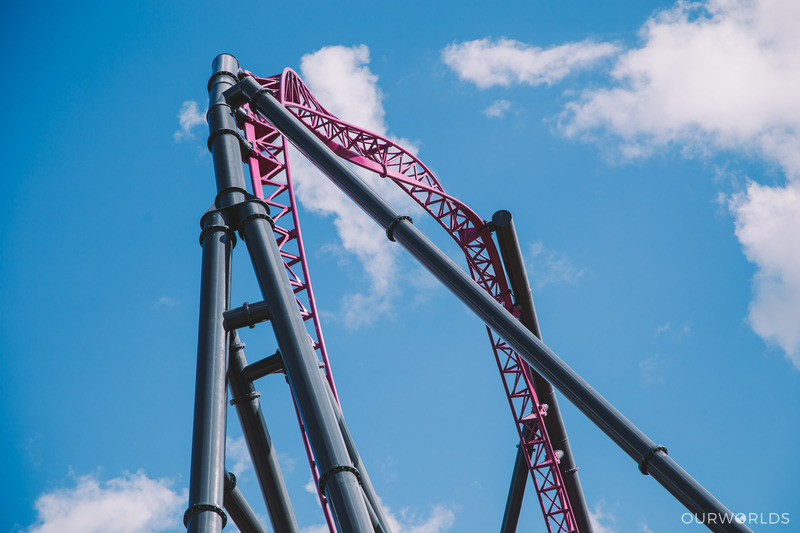 Not breaking with tradition, here’s another signature OurWorlds update of Movie World’s DC Rivals HyperCoaster, chock full to the brim with nerdy construction photos only diehard geeks would appreciate, hipster angles & filters so sharp you’ll need to turn Vegan just to appreciate them & photo captions so void of wit you’ll begin to question your link-clicking choices. You’ll notice with this update that the shots were taken right on sunset. Yup. Time to set the hipster photo level to 11, Doc. Such colour. Much saturation. Wow. Contrasty non-inverting loop. Because i’m out of ideas for content and it’s eleven o’clock at night. A huge wrap that goes on forever is now covering the newly erected (teehee) fence. Here’s an arty closer look at it. 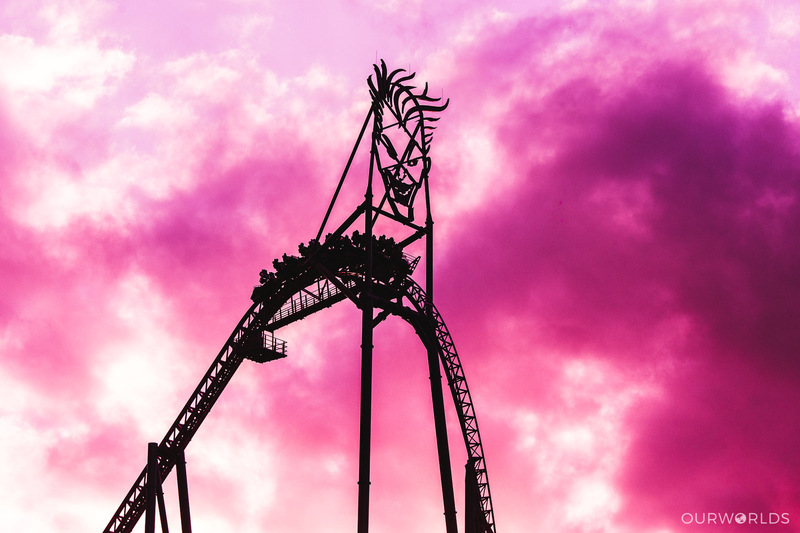 Everything’s in place now except for that pesky lift hill. Big booty hills and little booty hills are now rockin’ everywhere. So the lift hill is now awaiting erection. Here’s some un-erected track. Erectly. What on earth is this? Well i’m glad you asked. Cue hipster angle for perspective. Is it Magenta? Is it Fuchsia? Buggered if I know, so here’s an arty photo instead. Poor Green Lantern, it’s like when Cyclone was put next to Thunderbolt all over again. This’ll be a pretty kickass drop. Another view of a little bit of booty. One more artsy photo for the road. I lied. Here’s one more. No need to thank me. Here’s a shot of the station construction and final turn. Hope you enjoyed this update! More photos to come soon! OMG! 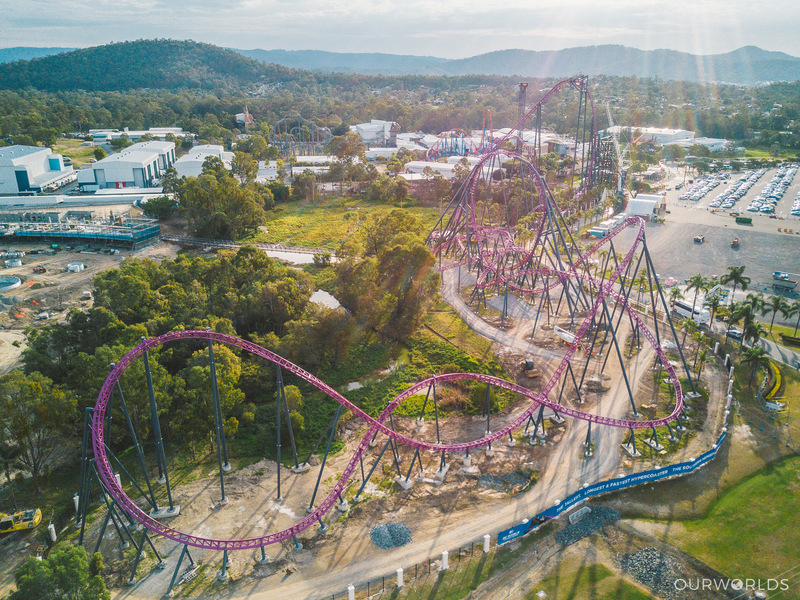 Did OurWorlds just get an Australian theme park first scoop!?!?! Someone repost this onto Instagram quick! Seriously though, thanks to the power of technology (well, mainly Lightroom) I think we can safely assume trains have arrived. Aren’t you glad you weathered a whole update of construction captions for this one photo? Okay for realz that’s actually the end of the update. If you liked this, you should share it on your Facebook or do what the youngsters do and tweet about it.